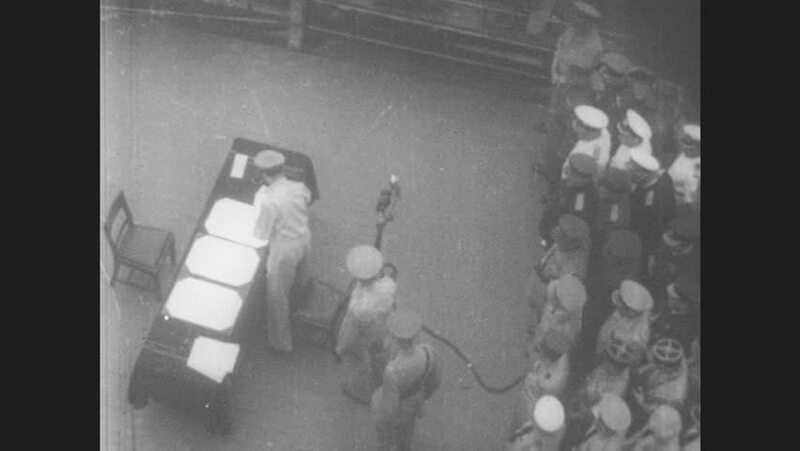 1950s: General Douglas MacArthur sits at table and signs the Instrument of Surrender as Jonathan Wainwright, USA navy and photographers stand on deck of USS Missouri battleship in Tokyo Bay, Japan. hd00:211950s: UNITED STATES: snails in aquarium. Hand pours jam jar of gold fish into aquarium. Boy pours tadpoles into aquarium. Lady speaks. hd00:191940s: Intertitle “Spiking”. Volleyball player stands next to net, jumps and hits ball over net several times. Boy serves ball. Match continues, Blue team scores. hd00:16UNITED STATES 1960s: Men hold astronaut with cords / Astronaut runs sideways on wall / Astronaut runs on wall. hd00:49CIRCA 1950s - In the 1950's the Cold War assures the Air Force must grow. hd00:05Time Lapse of morning clouds and sunrise. Great for a transition clip. hd00:141980s: UNITED STATES: astronauts walk outside space shuttle in space. hd00:29UNITED STATES 1950s: Engine block rotating in machine / Machine parts moving / Machine parts moving / Man operates machines in factory.